My Minifee Shushu is finally done! Yay! 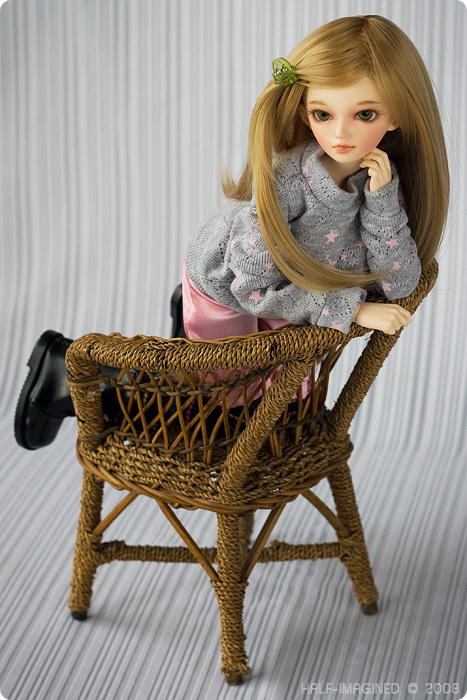 I received her back in mid-October with her very pretty default face-up. However, I decided I wanted a different look for her—a wholesome, girl-next-door, farm girl type of look. So, I sent her off with Katriss (my Beryl) to get her face-up done by Kittymaru. Unfortunately, when she returned home, I accidentally chipped her lips. My attempts to fix it just made matters worse and I ended up having to wipe her amazing new face-up. I felt sick and very pissed off at myself. 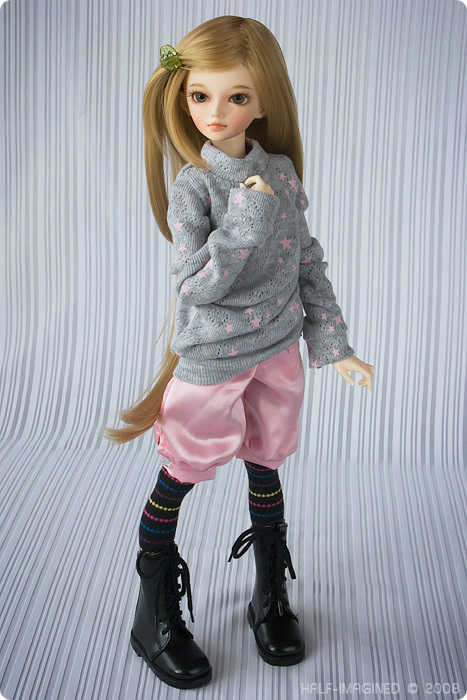 Luckily, I was able to send her back to Kittymaru and she got a (yet another) new face-up. When she returned home again, I did a few touch-ups on her—added more blush to her cheeks, tinted her lips a bit more, touched up the corners of her eyes (they had a bit of black in them from her eyeliner), attached her upper eyelashes and glossed her lips. I'm really happy with her completed look. So, a bit of a rocky start, but now that she's all done and looking so cute, it's easy to put the frustrations behind me. Name: …um…I don't know yet. She has the relatively new Active Line body from Fairyland, which means she has extra joints that make her more posable than the Beautiful Line body that used to be the only choice for Minifee dolls. I'm so amazed at how well she poses and, as a result, how easy it is to make her look natural in her poses. I only wish all my dolls could pose as well as she does. Oh, you definitely scored big on this one! You totally achieved that innocence of 'the girl next door'. She's beautifully adorable! And I'm just as surprised as you are how natural she looks as he poses! I thought E and D were very natural looking themselves but her… like, wow! Haha. Kinda like how Ginny was with Harry in Harry Potter and the Chamber of Secrets, huh? I don't know, but I can't really see a future with those two. Then again, it could just be me. I'm with you though. Shushu's fangirl crush on Julian is very one-sided and I don't see anything coming of it. I guess it's more like the crushes that any of us have on celebrities. Logically, we know that nothing will ever happen, but it's still fun to fantasize. She just happens to live in the same house as her celebrity crush! haha Julian is both annoyed and amused. She's so breathtaking. I agree with your mom, Lily is a nice name. Very farm-girl fresh. I like Jessica too. Jessica and Julian sittin' in a tree. Have fun! Thank you, Lani! Jessica is a good name too! Nothing has really struck me as being "THE" name yet though. No hurry, I guess. You have to admit, she is very lucky compared to most (myself included heheh). I'm sure she'll find some hot stud sooner or later that's better than Julian. Another child model perhaps? Hahaha. I actually have an idea who a future love interest may be for Shushu, but he's still in the sculpting stages so I'm not sure when he'll be going into production. Have you ever read the manga "Absolute Boyfriend" by Yuu Watase? Well, I was sort of thinking it would be fun to have a robot boyfriend for her. heehee The doll that I mentioned above is a robot boy so…well, we'll see. I really like how he's looking so far, but I may not end up liking the final product. It's fun to think about though. Oh she is just lovely and worth the wait! I have a LittleFee on order, and qualified for a free MiniFee head. I am so excited, I have heard nothing but good things about the Fairyland dolls. Thank you! You're getting a LittleFee? Congrats! I've been so tempted to get LittleFee Shiwoo–he has an adorable face and would make a great little bro for Wednesday and Shushu–but so far I've managed to not give in. Which little one did you get? I can't wait to see pictures of him/her. The Ante fullset. It will be months and months, the demand for them was apparently overwhelming. Her name is going to be Minette … since she is a minature Marie Antionette. I am also getting a Lady Saiyuki White Rabbit Ren limited. Her name is either Bunny or Valentine. (I like Valentine just because it would be "Minie and Teenie". I cannot wait to take pictures of her, she is adorable. Ante is so adorable! I love her fullset dress too. "Ugh" about the waiting though. You'd think we'd be used to it in this hobby, but the wait never seems to get easier. haha "Minie and Teenie"–I love it! Is this White Rabbit Ren? So cute! Yes, that is her. There is something so sweet and guiless and innocent in her little face that I fell in love. I was able to play with her at a meet last month and was completely won over. I pick her up at the end of the month at Idex. FP Ante is on a four month lay-away at DDE since there are none to be had anyway. I am excited to finally have 2 dolls that wear the same size. And you should see the re ment Alice in Wonderland/playing cards tea set I found for her. It was so cute I got one for me and another as a thank you for Natalie. Oh, I love that Re-ment set! I'd love to get it someday. It'll be perfect for your Ren. Yay! She's arrived! I was waiting to see what she looked like! She's really pretty. And are those Dr Martens she's wearing? As for the name, how about Erin or Janet? Thank you! It seemed to take forever to get her ready to show you guys. But, in the end, it was worth it. They do look like Docs, don't they? heehee I've always loved Docs. And thank you for the name suggestions. I've added them to my list. You could always try a baby names site, like this one: http://babynamesworld.parentsconnect.com/ that has the origins and meanings of all the names. Yeah, I took a look at some baby names sites, but was a bit overwhelmed by all the names. haha I did come up with a name for her though–Kaylee Reynolds. She's named after two of my favorite characters on the TV show "Firefly". Nice choice, of name, I like it! Thank you! It really fits her, I think.